Home / play / Good green fun! Whew – this seems like an idea that took too long to be realized, doesn’t it? 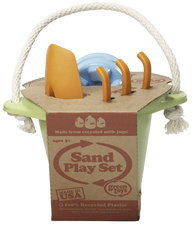 I have seen the cute little sandbox set at a few retailers around the city and was pleasantly surprised to learn that they are green toys. 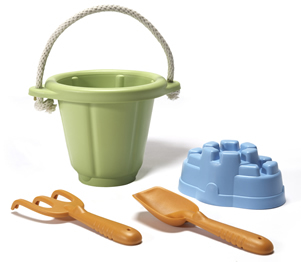 Green Toys Inc. is the company that makes a product line of toys that is now limited to four items: tea set, indoor gardening kit, sand play set, and cookware and dining set. The packaging of each toys is make up of recycled cardboard and is minimal in design (devoid of plastic, twist ties, and all those other unnecessary add ons). I sincerely hope this is a glimpse of the future of toys. ← WONDERful. Wildflowers and Lullabies.